Our infographic provides a detailed explanation of a sample bill in three easy steps. Firstly we have the 'header' section, then an outline of the body content of a bill and lastly, the 'footer' section. All content relevant to helping you understand your bill have been grouped and labelled '1' through '21' and the corresponding explanations can be found below. 1. Your personal customer reference relates to your account and tells us who you are. This section also indicates the date your bill was prepared by us, the bill number generated by our computerised billing system and the number of pages that your bill consists of. 2. The bill address contains information regarding your full name and address (the details of the individual or business which is being billed). 3. This section represents the current billing period or quarter for which readings were taken and charges are to be applied. 4. Connect Saint Helena Ltd Tax and Company registration details are found here. 5. The service address outlines the premises to which this bill applies (eg. your home or business premises). 6. Outstanding account balance amount as of the date your bill was prepared by us - this might be monies you owe us from a previous billing period, or monies that we owe to you and will be used to offset your total bill amount. 7. The date of the last payment we have received from you. 8. New water meter readings and cost - details include meter serial number, date the reading was taken, actual or estimate reading, usage since 'last previous' and 'most recent' reading, water usage amount due. 9. New electric meter readings and cost - details include electric phase type, meter serial number, date the reading was taken, actual or estimate reading, usage since 'last previous' and 'most recent' reading, electric usage amount due. 10. Fixed standing or rental charges applicable to meters or services supplied. 11. Total ﻿﻿amount ﻿﻿due of new quarterly period charges. 12. ﻿﻿Total ﻿﻿﻿﻿billing ﻿﻿amount and date by which to be paid. 13. 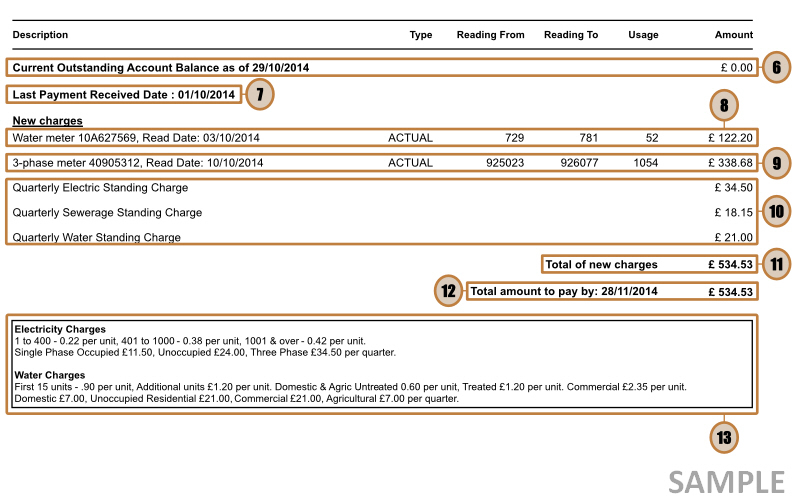 Utility tariff indicating electric and water charges currently in force and applicable to your current bill. 14. Customer ﻿﻿Name﻿﻿: your full account name as detailed in the bill address section above (2.). 15. Our Bank of Saint Helena deposit account name and number into which the total amount due (11./12. above) for your bill should be paid. 16. Date on which you are making payment. 17. Your Bank of Saint Helena account number from which you are making payment to us. 18. Your signatory authorisation - authorising payment to us. 19. ﻿﻿﻿﻿Replication of bill date and customer reference number as (1.) above. 20. ﻿﻿Total ﻿﻿﻿﻿billing ﻿﻿amount and date by which to be paid as (12.) above. 21. Actual amount you intend paying towards your total billing amount.